The pot-au-feu (French for "pot on the fire") is a French beef stew. Many countries have similar dishes with local ingredients. spices: bouquet garni, salt, black pepper and cloves. Cooking cartilaginous meat in the stew will result in gelatin being dissolved into the broth. If the stew is allowed to cool, the broth may turn into a jelly, resulting in an interesting texture. Allowing the stew to cool also allows the removal of excess grease, which floats on the surface and congeals. The dish is often served with coarse salt and strong Dijon mustard and sometimes also with gherkins and samphire pickled in vinegar. 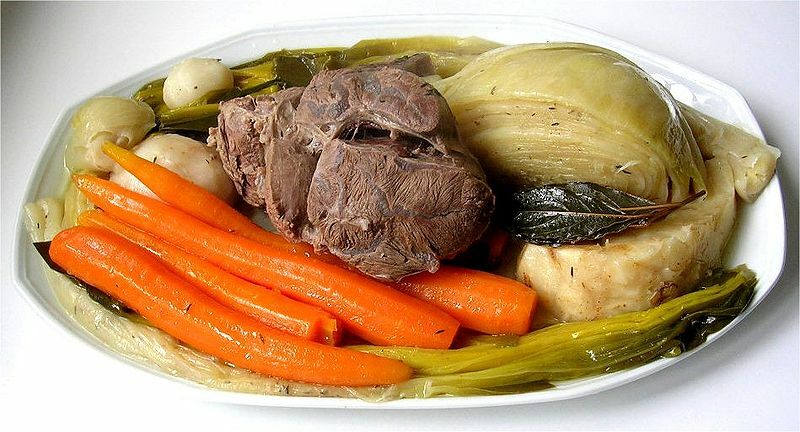 The pot-au-feu broth may be used as a soup (often enriched with rice, pasta or toasted bread), as a base for sauces, or for cooking vegetables or pasta. There are ready-to-use concentrated cubes to make what purports to be pot-au-feu broth when water is added. A pot-au-feu—a pot always left on the fire—could be a continuous affair in the past, with new ingredients added as some is used; nowadays houses do not have a permanent fire in cold weather, and the dish is cooked for a specific meal.